Who is the Hao Staff (Piano Roll) Sheet Music for? How does one actually start (with the Hao Staff)? Just watch the 2-minute tutorial video below, read the 2-page Hao Staff User Guide, best in front of a piano keyboard. Then try out the pieces in the "Getting Started" category. With that, you are very much set to try and practice whatever music you like in the catalogue of this site. We need to emphasize the importance of an instructor for the beginners to get the right fundamentals, e.g. the posture, the hand shape, how to use the fingers, etc. The teachers don't have to read the same Hao Staff scores, which they are not used to. They can use the original Grand Staff music scores which are all available for (free) download on this website. Is the Hao Staff meant to replace the Grand Staff? Not at all. Hao Staff is typically meant for a few groups of people as mentioned above, especially adults. It is not recommended for people aiming to become serious musicians. It cannot (and is not meant to) replace Grand Staff, which is the universal language of music. Is the Hao Staff recommended for children? In principle, it is not recommended to be used by children who should be given time and opportunity to learn the Grand Staff, which is the universal language of music (for many other instruments). Can the Hao Staff be used for music for instruments other than the piano? There would be no benefit of that. Let's keep it to piano and keyboard. Are the music notes of the Hao Staff Sheet Music different? No. The staff is the only thing that is different. All the notes and marks are exactly the same as those used on the Grand Staff. The commonly used music notations can be found in most music theory books. The position of the note-head on the staff represents the pitch (i.e. which piano key to play) of the note. The different shapes and forms of notes represent different "rhythm" or timing, i.e. when they are played and for how long the sound should last. Do not worry if you don't know how to read the timing of the notes. 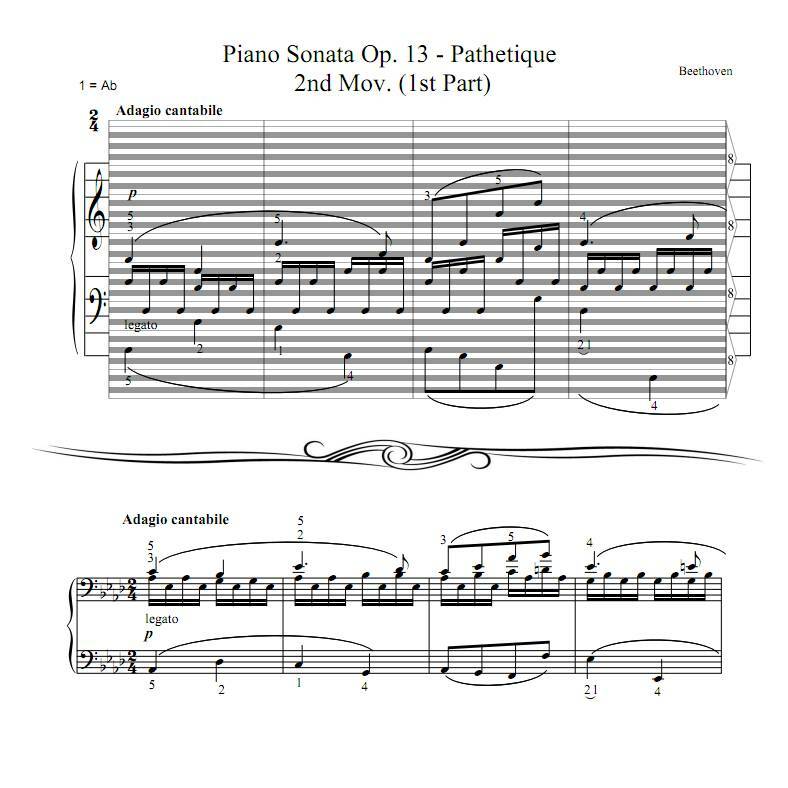 You can use the Hao Staff piano music score (to find the right keys to play) together with the MP3 audio file, which will let you learn the rhythm and timing of the notes BY EAR! Can people sight-read the Hao Staff Sheet Music as well as the Grand Staff? Probably not, compared to those who have learned Grand Staff from young age. But the ability to learn Grand Staff (like the ability to acquire a new language) becomes very limited as one grows older. The Hao Staff is definitely a big "shortcut" in music reading for most adult beginners. With Hao Staff, why do we still need teachers? Hao Staff is just a form of music score which is more approachable for some people. It contains the same information that the Grand Staff score does. But there is A LOT more than reading the score in playing an instrument. 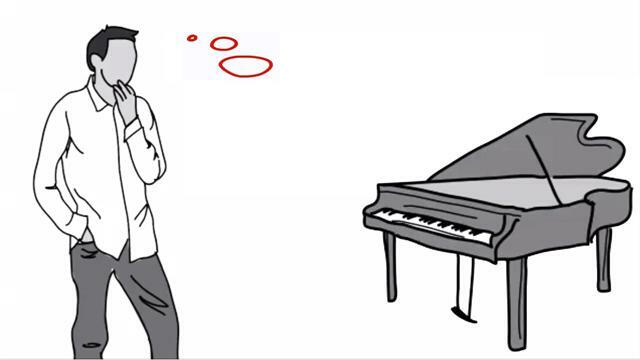 What is different, though, is that instead of spending a lot of time practicing to get good at Grand Staff sight-reading, you (and your teacher) can move much faster to work on how to practice what you want to learn to play. Hao Staff enables your teacher to help you reach your goal much faster.